Grrrrrrr……Did you hear that? That’s your stomach talking. You look at your watch. Shoot! Dinner time already? You rifle through your cupboards. You throw open the fridge. You even take a peek in your roommate’s drawer next to her bed where she keeps her secret stash of chocolate. And all to no avail. Other than some old rye bread and the dusty remnants of a box of muesli, there isn’t much there. It can be so difficult to cobble together a meal, particularly as a student. Minimal free time and a limited budget leave our pantries and refrigerators wanting. One of the things I miss most about home, other than my family and my shower seat, is my fully stocked fridge, endless variety of spices, and overflowing cabinets. Any inspiration that hits, I’m ready to whip it up. But here, well, baking and cooking usually takes some forethought. 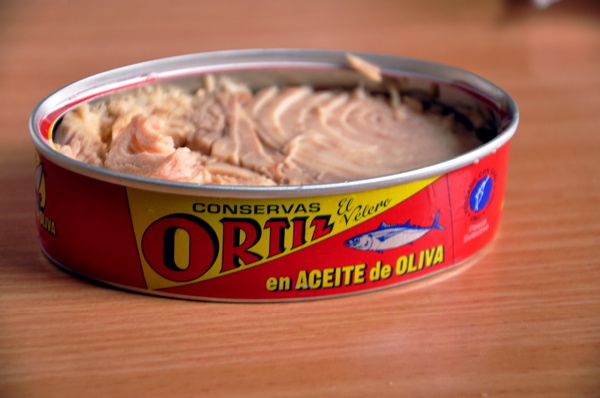 There are a few things that I almost always have on hand, and luckily, they come together quite nicely into a healthy, delicious, and filling meal: Ortiz oil-packed tuna, tomatoes, lemons, onions, salt, and pepper. All of the ingredients keep at room temperature, and all of them, minus the tomatoes maybe, last for a long time without going bad. Dice a tomato, slice up an onion, and toss it together with a can of good tuna (trust me, it makes a huge difference to have a good-quality can), a squeeze of lemon juice, and a sprinkle of salt and pepper and you have a super tasty, fresh meal that will be the envy of all of your wild-eyed, ravenous roommates. 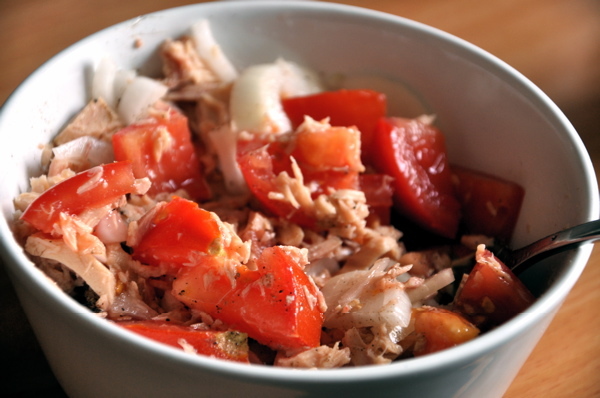 Toss together tuna, tomato, and onion in small bowl, breaking up the tuna into bite-sized chunks. Squeeze lemon juice over the tuna. It will make a sort of dressing when combined with the olive oil. Sprinkle with salt and pepper, to taste.